Drinking hot berry punch and hot chocolate to stay warm at the Christmas market. We’re definitely having a nice time here in Vienna. 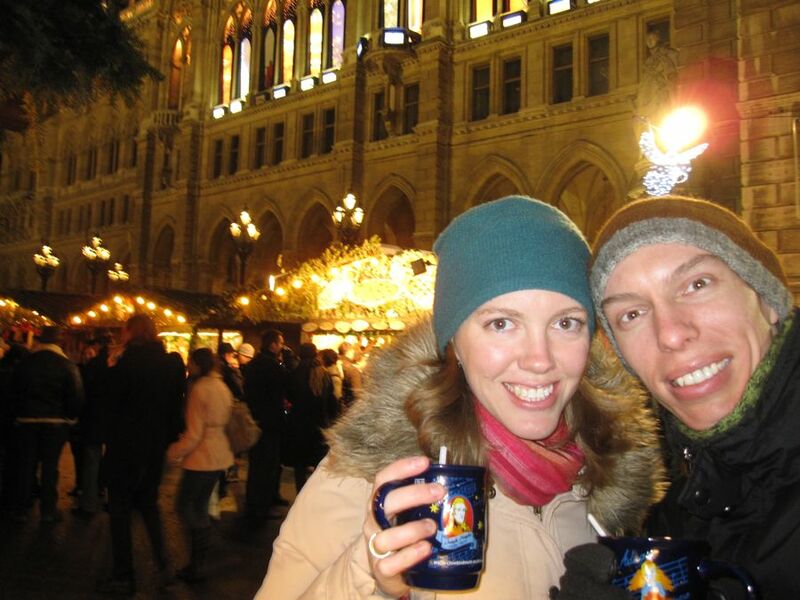 We’ve walked around lots of Christmas markets, drunk hot mulled wine, eaten roasted chestnuts, thrown snowballs at statues of random Hofburgs, and gorged ourselves on good food and beer. Tonight and tomorrow we plan on going to all the Christmas masses we can take, including Christmas morning mass at the Imperial Palace Chapel with the Vienna Boys Choir. We’re hoping to overdose on the real Christmas spirit, along with some great music. But, really, we are just trying to distract ourselves from how much we miss our family and friends back home. We hope you have a warm and Merry Christmas! We love you! PS. Click on the blue “emmaandalex” banner above for a Christmas surprise! 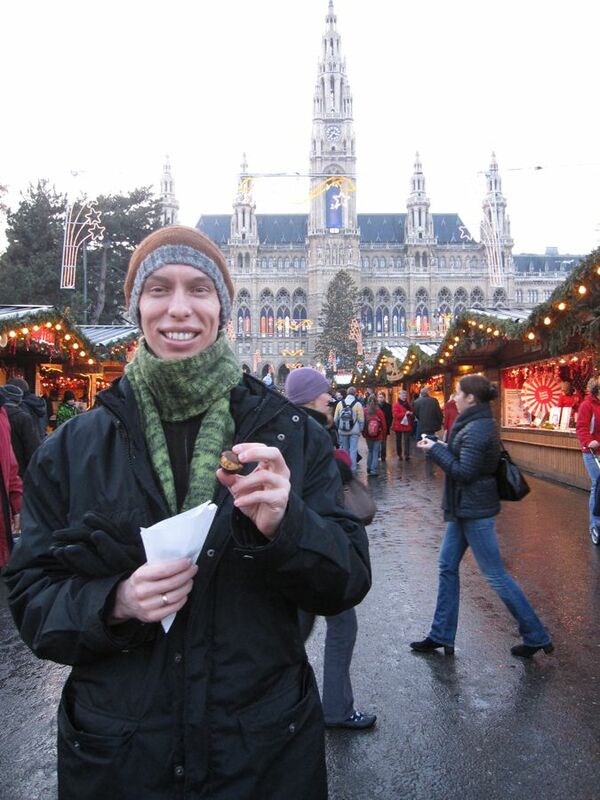 Alex eating his first-ever freshly roasted chestnuts. 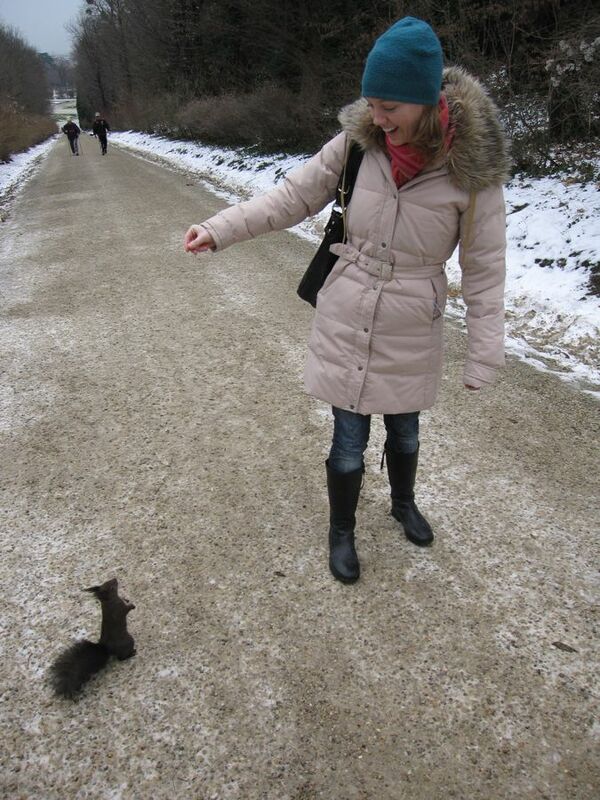 Emma taunts the crazy tufted-eared squirrels in the Schonbrunn Palace gardens. In case you missed this storyline, I’ll give you some background. Emma and I met the local weight training coach this summer when we were living in the Lyceum dorms with his star trainee, Sasha. An invitation to come to his training hall and get back in shape somehow evolved into me agreeing to train 6 hours a week for my eventual triumph at Ukraine’s national arm-wrestling championships. Goal #1: Do not get an arm torn off your shoulder. My arms don’t even hurt. I guess all the training payed off. Goal #2: “Show up” for at least one fight. I was hoping to at least make it hard on one person to beat me – maybe last 2 or 3 seconds. But I actually won a round! It was double-elimination left and right arm, so I expected to lose 4 rounds pretty straightforwardly. My right arm came through, though, on the first round. Goal #3: Do not die in a twisted heap of rusting metal. 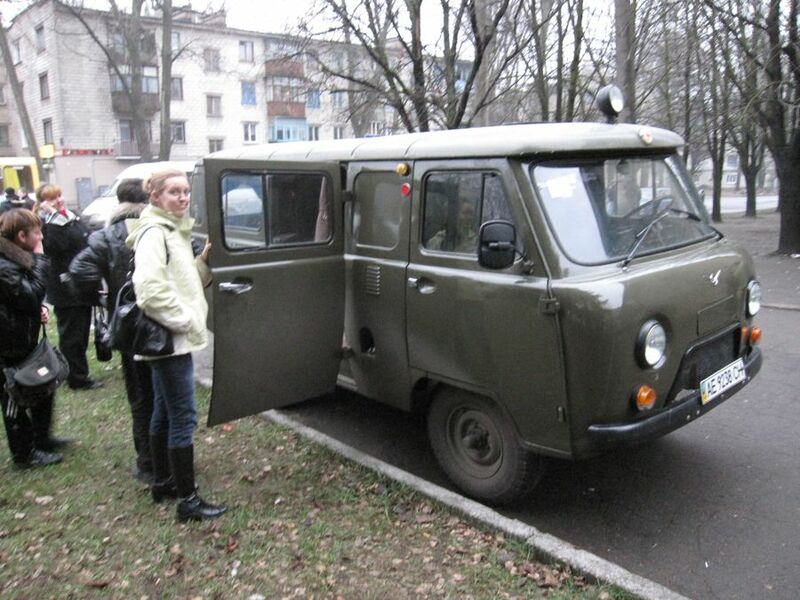 (Goal added post-hoc) Our chartered marshrutka broke down last minute, so we threw a couple gym benches in the back of what I swear was a medic van stolen off the set of M*A*S*H, and piled 14 people in. This is not a country for those OCD about seat belts. Tomorrow, back to school and then to the gym! UPDATE (2 hours later): I’ve definitely come down with something so tomorrow’s plans are out. Two tables of fully officiated armfighting action! The backdrop was so awesome it made you flex your biceps involuntarily. I actually won this one. 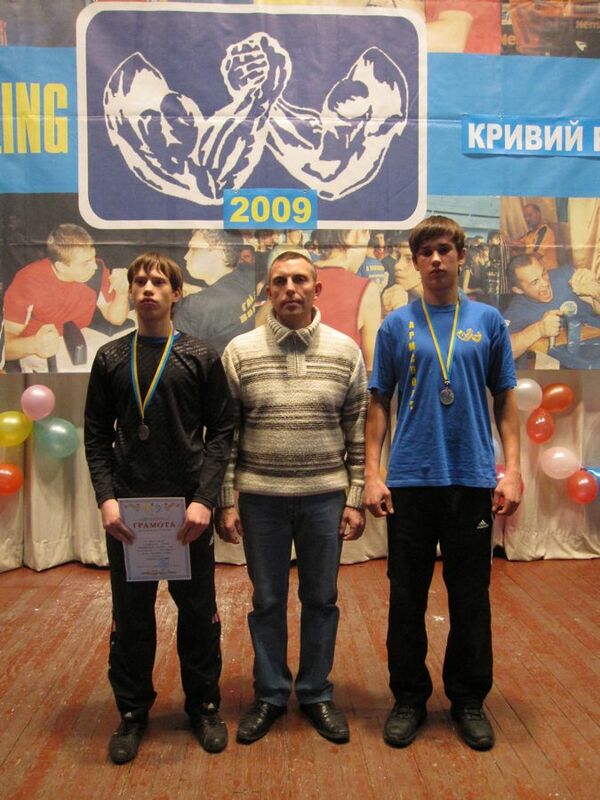 That's my trainer, Victor Alekseyavich, with the guys from our group who placed.